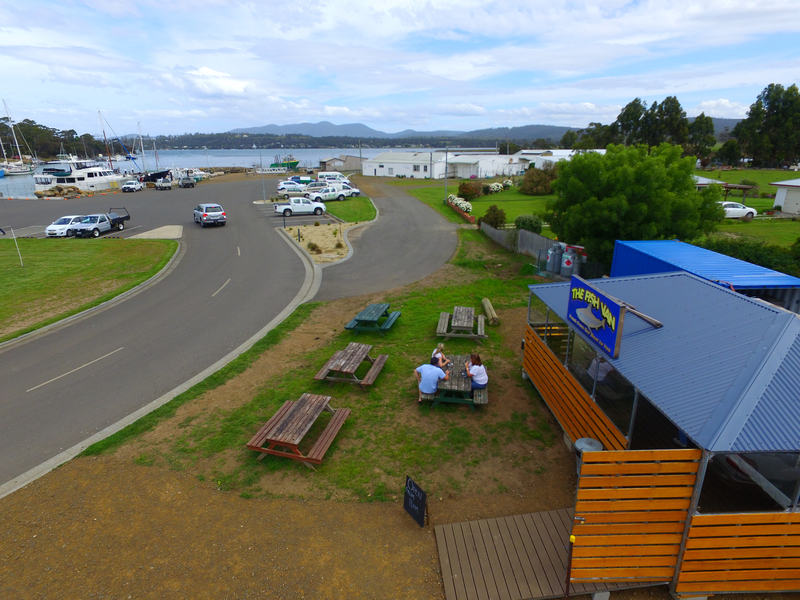 The Fish Van sits just a few metres from the fleet of East Coast fishing vessels that call Triabunna home. We get access to the freshest fish available, most of which is caught only a stones throw away in the pristine waters off Maria Island. Fish and chips are cooked to your liking while you wait. Whether its crumbed, battered, or grilled, we will cook your chosen fish to your liking. You can relax on our garden benches and watch the action surrounding the marina or take a walk around and look at the boats that bring your fish to our van. We also sell fresh fish and crayfish if you would like to take some home to cook yourself! Our Fish - Here's a bit of information you might not have known about the fish we serve up. It’s all caught just a stones throw from the Van and it’s all from sustainably managed wild caught stocks. Blue Eye Trevalla - caught wide of Maria Island in the deep waters near the Continental Shelf, Blue Eye offer a firm, white flesh. They are arguably Tassie’s most famous table fish and for good reason.The fishery is sustainable, commercial fisherman using drop lines with baited hooks to catch their Blue eye in waters around 500 meters deep. Pink Ling - another fish caught in deep water off our East Coast. The pink ling may not be the prettiest fish in the sea, but they sure are tasty. Gummy Shark - everyone is familiar with flake and chips. But our flake is the freshest you'll find anywhere in the state. Again, caught from sustainably managed wild stocks just a short boat ride away from Triabunna’s wharf. Stripy Trumpeter - many locals will tell you Stripy is the best eating fish in Tassie's waters. Supply is hard to get, but because The Fish Van knows all the old salts at the wharf, they will serve up a feed a stripy more often than not. crayfish ports. The southern rock lobster are famous around the world, and although most are shipped live to the Asian markets, the Fish Van always has a cray or two on hand. Try a cray roll - you won't be disappointed! Flathead - Tasmania’s flathead are the best eating in the country! It’s a big call, but in this part of the world, the locals live on the stuff. They are superb, and the waters around Maria Island are teaming with them.